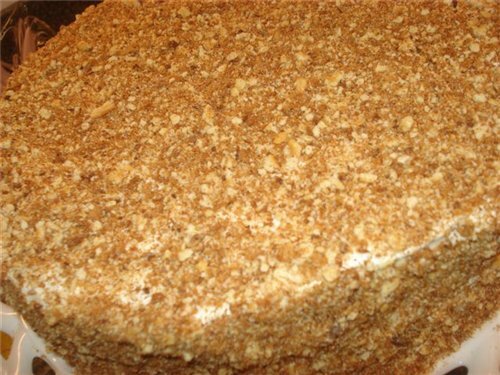 Sour cream cake , also called "sour cream" - surprisingly tasty and tender treat. It literally melts in your mouth. The sour cream is what for him a little trouble at the plate. Recipes many, among them multi-layered sour cream cake. In a bowl, put 400 g of sour cream. Add in sour cream, vinegar gashenuyu soda. Then add the eggs, oil and melted butter. Mix well, stir in 2 cups of sugar and stir again. Then gradually pour the flour, carefully mixing the dough after each addition, it should be soft and pliable and does not stick to hands. Ready dough leave it for 30-40 min. After that, start baking cakes. Divide the dough into several equal parts. From the amount of ingredients that is stated in the recipe, you can get 6-8 cakes, depending on the radius. Spread on the table a sheet of paper for baking and put it on one of the pieces of dough. Roll it to a thickness of 5-7 mm. Put a sheet of paper for baking with a baking sheet and place in oven, preheated to 200 degrees. Bake for 5-7 minutes. the Cakes are very thin, so watch out for them, do not desiccate. After baking the cake, trim the edges on the stencil, for example a plate in which you serve the cake. Trimmed put, they are very useful for decoration. In the same way prepare the remaining cakes. Now move on to preparing the filling. In a bowl put 600g of sour cream and beat with a mixer, gradually powdering 1 Cup sugar and vanilla. In the end it should be air resistant foam. In order that the edges of the utensils were clean, and so beautiful, you can put on the edges of the baking paper. Take a sheet of paper, fold in four and cut the angle along the arc, expand. You now have a frame with a circular cutout in the center. Cut the frame in half and place on your plates overlap. Now lay alternately on a plate of cakes and obmazyvat their sour cream. It was the turn scraps of dough. Chop them and sprinkle on cake top and sides. Now carefully remove from the cake the baking paper, the cake is ready. You can do either one high cake, or two small.